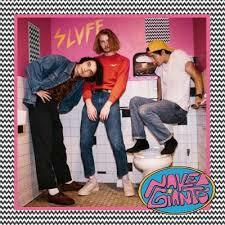 Three young men hanging around a toilet as cover art? That ought to make me suspicious alright. Being my age and all. Luckily I'm not put off that easily. So I dug into that record called Sluff. "One two three four" is missing as the first words on the album. I am remembered instantly of my favourite Ramones songs. Except that these youngsters do not muster that speed and do not seem to be seeking it either. Another name pops up immidiately, Canshaker Pi. But in the end Naked Giants are not half as dirty as the Amsterdam based band. Naked Giants may colour inside of the lines more, it does know its punkrock and garage rock classics. The result being that Sluff is filled with the kind of songs that rock on with that little edge and a lot of energy. The drums are pounded, the bass rages and the guitar fills in all the holes left by the rhythm tandem. Over it all those fine kind of melodies are sung resulting in a fine record. Naked Giants releases its first full length album with Sluff. An album on which it is in search of an own identity. Which is quite alright for a young band. From punkrock it can switch to a more reggae based song to a song that could easily be sung by Brittany Howard of Alabama Shakes. Naked Giants are not afraid to change its sound around a bit here and there. Naked Giants is Gianni Aiello: bass, guitar, vocals, organ, percussion, Grant Mullen: guitar, vocals, organ, percussion, bellzouki, Henry LaVallee: drum kit, vocals, percussion, bellzouki. Production duties were delevered by Steve Fisk. Everybody does a little of something extra. Some friends helped out on more specialised duties. It all leads to a sound that the trio can easily reproduce on stage. Undoubtedly kicking up a storm and conquering fans venue by venue. If not Naked Giants does something wrong. My guess is they are. It all totals to a fine debut album that puts Naked Giants in modest spotlights with certainly a chance for more. It doesn't tackle Tusky of its 2018 punkrock throne and I am very curious what Canshaker Pi will come up with early May. In the meantime Sluff is a fine record to enjoy and has the potential to grow.